The rapid rise of bullying has been recognized as one of the most concerning phenomena of the last decade. In response to this, KMOP (Family and Childcare Centre) in Greece has developed and launched its new programme “Live Without Bullying”. “Live Without Bullying” is a pioneering innovative programme for Greece. At its heart lies an electronic platform, where children and adolescents facing bullying problems may seek help and support from peers who get a special training so as to become online mentors. These peer mentors are constantly under the supervision of professional psychologists and chat administrators. Moreover, educators and parents have a separate forum in the platform for exchanging views and getting advice from psychologists. Rich informational and educational material on the issue of school- and cyber-bullying is always available for users in the form of multimedia content through an electronic library. All the mentoring sessions for users which take place online are free and anonymous, encouraging thus children and adults to express their worries and seek support from the comfort of their own home. The programme is being implemented in cooperation with the Adolescent Health Unit of the 2nd Paediatric Clinic of University of Athens, “P. & A. Kyriakou” Children’s Hospital, and the University of Peloponnese. The programme is already being rolled-out in a municipality of Attica with success and it is hoped that in following academic year it is going to expand to a large number of towns across Greece. More than half (55%) of children in Europe who have been bullied said they became depressed as a result, with over a third saying they harmed themselves (35%) or thought about suicide (38%), according to a new poll* conducted by BeatBullying and the #DeleteCyberbullying campaign. The poll of more than 2,000 adults and children from across Europe found that worryingly, 34% of adults thought that bullying is regarded as a ‘normal part of growing up’, and one in six adults (16%) said it is regarded as ‘character building’ by most people in their country, raising concerns amongst campaigners that the pain caused by bullying still remains hidden to many European citizens. To raise awareness of this issue and show their support for the millions of children affected, today, young people, parents, schools, and other organisations are joining The Big March 2014 to deliver a virtual petition to the European Commission, calling for new laws and much-needed funding to protect children from bullying and cyberbullying. The event will be held on 4th June, 15:00-18:00 CET, followed by a light drinks reception at the Northern Ireland Executive Brussels Office. [Live streaming available]. One and a half years after the launch of the #DeleteCyberBullying Project, it is time to take stock of the milestones and achievements of the campaign and look at the challenges that still lie ahead. The work achieved by the project is the successful cooperation of eight organisations from seven different countries, Belgium, Hungary, Spain, the UK, Bulgaria, Greece and Finland. The partners brought different perspectives and experience to the project, but all agreed, that effective prevention and early detection of cyberbullying is key, and can be best achieved by informing parents, teachers and teens about the different forms it can take, and how to react. The project was a very ambitious undertaking, and among others delivered a successful European conference in Madrid in May 2013, a very popular short educational animation (with over 50.000 views on YouTube), as well as the app for phones and tablets, for the time being in Android version, with the iOS version expected by September. The project also calls upon the expression of solidarity and civic courage through the virtual, online Big March to be held on the 11 June 2014. Through the tools developed by the partnership, key messages are to speak up, and tell a trusted adult about cyberbullying. Have your voice heard: join us in The Big March! What better day to call on citizens to join our effort in asking the EU and Members States for more effective legislation, than the UN’s World Day of Social Justice, as Member States themselves have signed up and pledged their commitments to fighting inequalities, and helping the most vulnerable. Perhaps the fight against bullying could also deserve its own European Day. It is very easy to take part in our peaceful online demonstration: participants are invited to register on bigmarch.beatbullying.org and create a personalised avatar of themselves, and eventually join masses of other citizens across the EU in marching across some of the most well known websites on the 11th June. 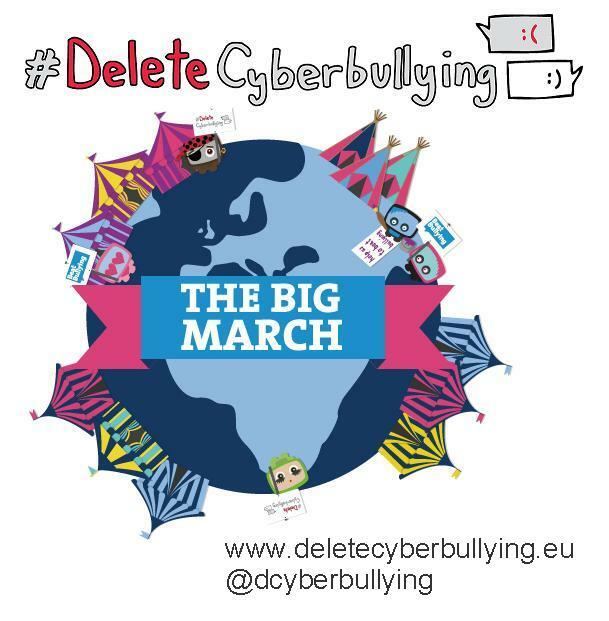 Please also come and visit the #DeleteCyberbullying tent in the Big March Park, where you can see what our project is about, the short animated video in 9 languages, our infographics and the testimonies of young people. To keep up-to date on the fight against cyberbullying, follow #deletecyberbullying on @dcyberbullying. This year’s Safer Internet Day theme looks at the responsibility that we must all take in making the internet a better place. Whether we are children and young people, parents and carers, educators or social care workers, or indeed industry, decision makers or politicians, we all have a role to play. Children and young people can help to foster the positive by being kind and respectful to others online, by protecting their online reputations, and by seeking out positive opportunities to create, engage and share online. They can help to eliminate the negative by being ‘helpful bystanders’: supporting peers if they encounter issues online, taking a stand against cyberbullying, and reporting any inappropriate or illegal content they find. 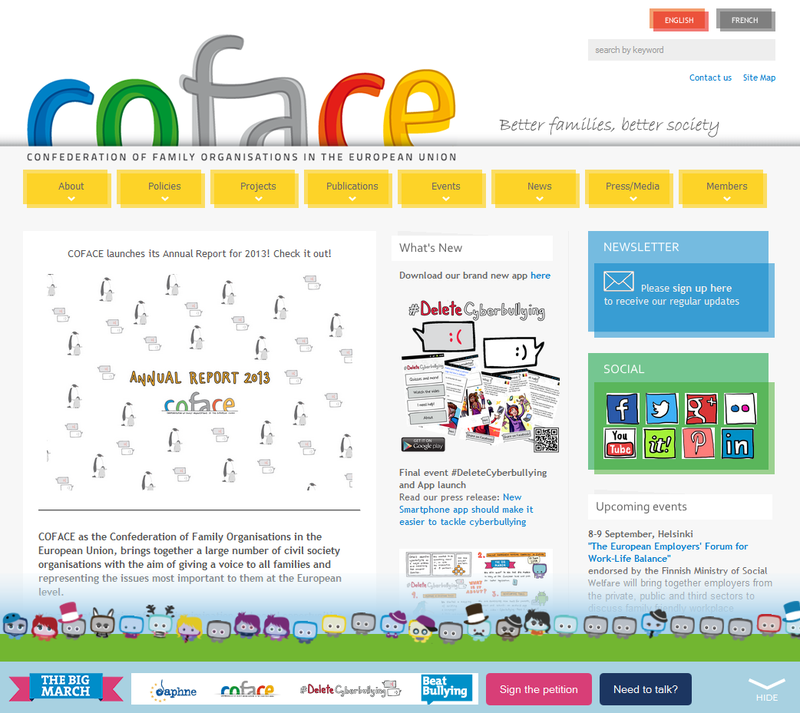 In this regard, COFACE is currently coordinating the European Awareness Raising Campaign on Cyberbullying: #DeleteCyberbullying. The project, through the cooperation of the international partners, contributes to developing a common approach to risk-prevention, information and guidelines to families, parents, children and other relevant stakeholders. We have created a short educational video Cyberbullying: there is a way out! available now in 9 languages. Parents and carers can help to foster the positive by maintaining an open and honest dialogue with their children about their online lives, by supporting them with their personal development online and helping them to deal with any concerns or issues, seeking out positive opportunities to share with their children online, and helping their children to find and use good quality digital resources. They can help to eliminate the negative by monitoring and supporting their child’s online activity, by modelling positive online behaviours themselves, and by also reporting any inappropriate or illegal content they find. Educators and social care workers can help to foster the positive by equipping children and young people with the digital literacy skills they require for today’s world, and giving them opportunities to use and create positive content online. They can help to eliminate the negative by supporting youngsters if they encounter problems online, and by giving them the confidence and skills to seek help from others. Industry can help to foster the positive by creating and promoting positive content and services online, developing ethical and transparent policies, and protecting our data. They can help to eliminate the negative by making systems and services more secure by design, by being more responsive to user concerns, and by providing quick and easy access to support if things do go wrong. Decision makers and politicians can help to foster the positive by ensuring that there are opportunities in the curriculum for children to learn and teachers to teach about online safety, ensuring that parents and carers have access to appropriate information and sources of support, and that industry are encouraged to self regulate their content and services. They must also take the lead in governance and legislation, and ultimately ensure the safety and wellbeing of children and young people through effective child protection strategies for the online world. Safer Internet Day is organised by the joint Insafe/INHOPE network, with the support of the European Commission each 11 February to promote safer and more responsible use of online technology and mobile devices, especially among children and young people. On Safer Internet Day hundreds of events are organised to raise awareness of online safety issues.